Stellar Four: What's Your (Street) Sign? 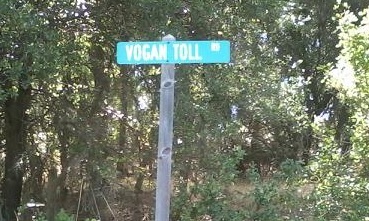 On the way to Jackson, CA on highway 88 you will find the Vogan Toll Road. A street name so unbelievably awesome it needed it's picture taken. Why did I find it awesome? Because in Hitchhiker's Guide to the Galaxy the Vogons destroy Earth to make way for an intergalactic highway. The hubs and I made up a story in which the plucky residents named their street in response to the highway cutting through their view of beautiful Amador County. I liked that idea. It's something I would do. Unfortunately it's all complete and utter fiction. The Vogan Toll Road was created early in the Civil War years as an alternate route to Jackson. However, I was not deterred after this deflating discovery, so I went on the lookout for some genre street names that are not figments of my imagination. A leisurely internet search showed lots of proposals for naming alleys "Diagon Alley" (surprise, surprise), although my favorites were the proposed Firefly-inspired roads for a suburban development. How awesome would it be to live on Browncoat Boulevard? Although I have to admit, while I might enjoy that, I wonder about the vast hordes of suburbanites. I also didn't search too hard to see if this plan came together. I think I prefer the fantasy that someone, somewhere is enjoying the high life on Serenity Lane. How about you? If the choice was yours, what street would you name?